Burglars won’t find your home an “easy mark” if they are forced to work in the light, if they have to take a lot of time breaking in, or if they can’t break in without making a lot of noise. Research shows that if it takes more than four or five minutes to break into a home, the burglar will go elsewhere. Most insurance companies provide discounts for devices that make home safer – dead-bolt locks, window grates, bars and smoke/fire/burglar alarms; however, when improving the security of your home, don’t exchange security for personal safety. Don’t make your home such a fortress that you are unable to escape in case of a fire or other emergency. Are any of your valuables-paintings, a silver collection or a computer easy to see from outside the house? Rearranging your furnishings might be advisable if it makes your home less inviting to criminals. Force any would-be burglar to confront a real enemy-light. Exterior lights and motion detectors, mounted out of easy reach, can reduce the darkness a burglar finds comforting. Simple security devices-nails, screws, padlocks, door and window locks, grates, bars and bolts-can increase the amount of time it takes to break into your home. Make sure you have strong doors. Outside doors should be metal or solid hardwood, and at least 1.75 inches thick. Frames must be made of equally strong material, and each door must fit its frame securely. Even the most efficient lock, if it is placed in a weak door, will not keep out a determined burglar. Sliding glass doors present a special problem because they are easy to open but if you have these doors, you can find special locks for them. A broomstick in the door channel can also help, but cannot be depended on. Avoid giving information to unidentified telephone callers and announcing your personal plans in want ads, social media sites or public notices (such as giving your address when advertising items for sale). Don’t hide your keys in “secret” places outside your home-burglars usually know where to look. Tell police and dependable neighbors when you plan to be away and join with your neighbors to keep a close watch on what’s happening in your area-working closely with them is a good way to prevent crime. The Waterloo Police Department is offering free gunlocks to Waterloo residents. The gunlocks have been made available through Project Childsafe, a nationwide program developed by the National Shooting Sports Foundation and supported a U.S. Department of Justice grant. Safety kits will be available on a first-come first-serve basis. The kits contain a safety curriculum, and a cable-style gun lock. The lock fit on most types of handguns, rifles, and shotguns. 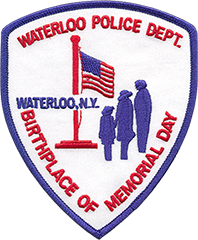 If you are interested in obtaining a gunlock or have any questions, please contact the Waterloo Police Department at 315-539-2022.